Asset management means working with you to protect and grow your nest egg. Our approach to asset management is based on “Modern Portfolio Theory” and other aspects of academic research that strive to capture expected returns in a cost-effective approach. By combining a market-driven process with a flexible trading strategy, we manage the tradeoffs that matter for performance—balancing competing premiums, diversification, and costs. 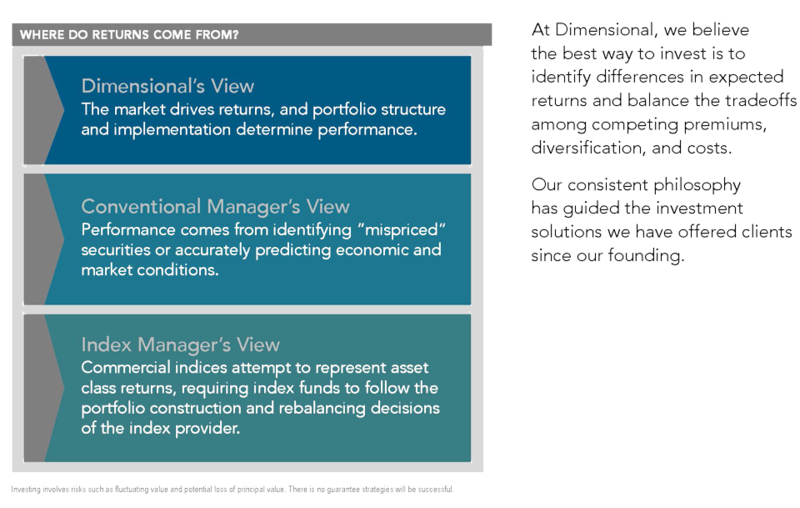 The Dimensional Fund Advisors investment process is different from traditional fund managers. Based on science, it has proven effective over the long term. Instead of looking for what makes each investment opportunity unique, as business analysts do, the academics and economists we follow—several have been awarded the Nobel Prize for their work in asset management—look at the market as a whole. The primary portfolio manager we use, Dimensional Fund Advisors, has a long history of managing time-tested investment strategies for clients with this process. Smart passive – We are one of a few approved Salem/Keizer wealth management firms who offer the expert management of Dimensional Fund Advisors. Learn more about DFA’s unique history and approach. Index funds – We also work with passive index funds from iShares, Vanguard and other industry leaders. Lower costs – Passive no-load funds on average have much lower expenses and transaction costs than similar, actively-managed funds. Lower fund-level costs usually help long-term performance. Greater tax efficiency - Passive asset class funds have lower turnover, so less of your annual return is taxed. Lower portfolio turnover – To minimize transaction costs and improve tax efficiency. Long-term perspective –A focus on long-term growth and earnings rather than short-term highs and lows. Over time this science-based investment philosophy has proven effective for our clients, achieving a maximum return at the lowest cost—which meets their goals and ours! Your first meeting with our wealth management professionals is complimentary. Use the button below to email us to schedule an appointment.